(left to right) Aimee Doherty and Mark Linehan in The Last Five Years. Photo by Christopher McKenzie. 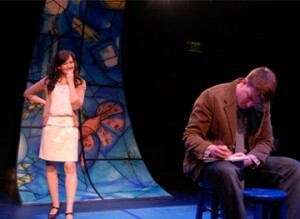 The Last Five Years, written and composed by Jason Robert Brown, New Repertory Theatre, 3/27/11-4/17/11, http://newrep.org/last_five.php. Less than a week after Elizabeth Taylor’s death, what story could be more apropos than the tumultuous romance of two artists? Jason Robert Brown’s chamber musical about the conflict marriage and career examines the fallout of two people who meet in the middle but remain apart. New Rep’s production of The Last Five Years delivers two masterful performances to a faulty libretto. Aimee Doherty shows her versatility going from the strong, sultry Luisa in Speakeasy Stage’s Nine to the sweet, neurotic Cathy in The Last Five Years. Doherty has such an expressive face that even the smallest uncertainty can be understood without words. When she does sing, her powerful voice matches that nonverbal eloquence. Cathy is a relatively undistinguished actress who falls for an up-and-coming novelist, Jamie, played by Mark Linehan. Linehan’s charisma makes it easy to see the attraction, but the audience can also notice his self-absorption from the beginning of the show. Linehan’s strong voice and energetic performance matches Doherty’s performance equally providing a very balanced perspective. The stage in the black box theatre is set in a processional format with arches, designed by Christina Todesco, that look like stained glass and set a sentimental tone to the show. The processional style allows the actors to have more freedom in their movements. The only problem with the show is the vague progression of time; for the most part, this comes from Jason Robert Brown’s ambiguous libretto. It takes a while to realize that the time progression for Cathy is completely in reverse and Jamie’s timeline is completely forward moving–particularly when the two of them meet in the middle for Christmas and their marriage. The technique is clever but more distinct hints in the libretto or in the actions should be provided for the audience so that they do not get lost. However, the two characters meeting up only in the middle of the show does effectively emphasizes the lack of connection and communication they have. With the exception of the ambiguities, New Rep presents a satisfying musical analysis of an attempted romance between two unyielding individuals who cannot connect except for a few moments. Doherty and Linehan’s dynamic performances overshadow the flaws in the script and provide some enjoyment for what is lost by the confusion of the timeline. TNETG. 3/31/11. This entry was posted in Musicals and Opera and tagged 2011, Aimee Doherty, April, artistic temperment, artists, Christina Todesco, Connection, Jason Robert Brown, March, Mark Linehan, musical, New Repertory Theatre, Professional, Romance, The Last Five Years by beccackidwell. Bookmark the permalink.